From August to September of 2017 I worked full time at a guiding company in Haines, Alaska. It was my first foray into seasonal work- ‘the nonstop work and play when the season is over' mentality. It was challenging to say the least, long hours, challenging weather all summer, and foraging new friendships left me treading water come August. The view from our dry cabin in Haines, AK! 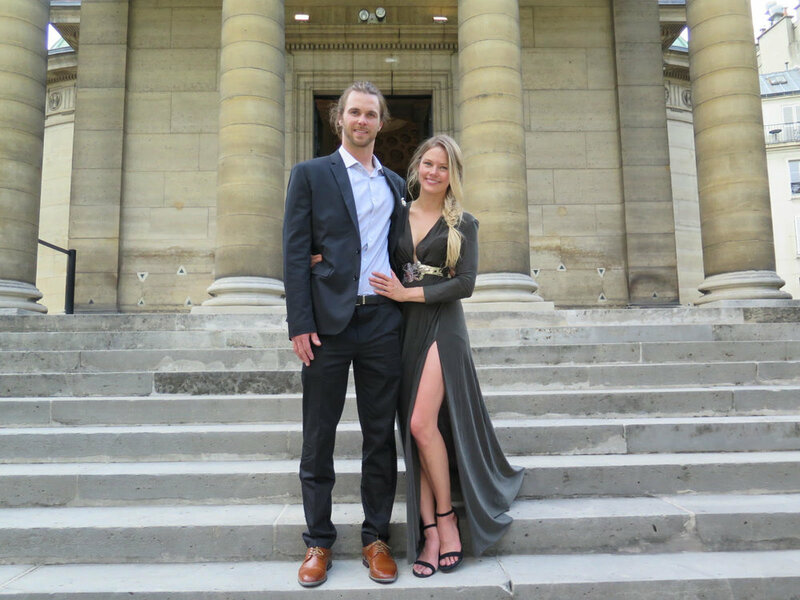 Before the season began however, my best friend Chelsay, called me and said she was getting married in Paris. The “Shout” song immediately began playing in my head, and I told her I would be there. After a bit of financial hesitation, I asked my partner Charlie, if he wanted to join me for this once in a lifetime trip. Additionally, since it was his birthday a few days after the wedding, I suggested we lay over in Iceland for a few days. Because that is of course what you should do when flying to Paris for a wedding! Dressing up for the first time in a year + ! Let me begin by stating that the rumors of Iceland are true- this country is pure magic. Another world of fantasy and mystery- from glaciers that come within 100 meters of the road, to fjords as long as the eye can see- you can literally imagine a little dwarf popping his head up from one of the moss strewn boulder fields. Landing in Iceland at 3:30pm we were greeted at the airport by the friendly Haukur, who works with Happy Campers. 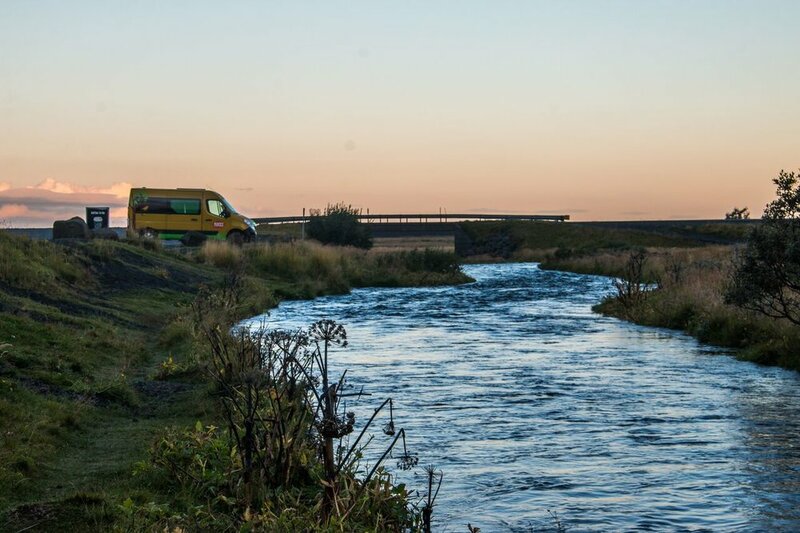 Van life is big in Iceland. You can’t go 1km without seeing some form of van rental, and with the easily accessible camping and epic vistas it’s not hard to imagine why. Happy Campers is a family run business just a few kilometers away from the airport. The friendly and bright facility is airy and welcoming to travelers. The entire staff was knowledgeable and genuinely wanted you to love their country as much as they do. 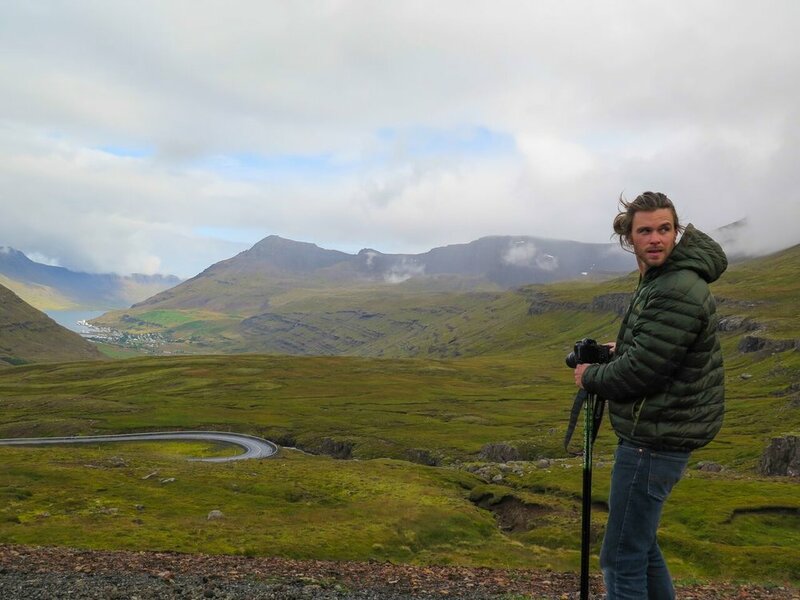 After checking out our van (which was EPIC) we spoke with Haukur for a while about epic places to go, hot springs not to miss, and food he would recommend. We were sent on our way with a personal book of hot springs that was his moms, and a head full of ideas. We drove for a few hours the first night, stopping at Hveragerdi, A 3km hike rewards you with a hot stream that welcomes bathers from all over. Various “levels” of the river are sectioned off creating a tiered effect of hot water. Changing stations and boardwalks flank the stream, making it very friendly to change and move around without disturbing fellow guests. A small caveat though, we did not know how far this walk would be and after traveling from Paris, and driving the hour to the trailhead we were a bit worked by the time we got back to the car, it is a bit steep. Hveragerdi Hot Springs are a must! Charlie and I decided that we would wake up early every morning in order to maximize our time. As the sun started to rise and hit the van, I stretched in the huge bed and couldn’t believe where I was. We opened the van door and gazed across the green field towards Seljalandsfoss. I hadn’t slept that well the night before, so I was a bit slow to rise but once I did Charlie took my hand and guided me to the most beautiful water fall I had ever seen. As we got closer he began to lead me up a dirt path to the side and we descended into the morning mist and waterfall spray behind the falls. A small, rocky path leads around the whole fall and behind it, drenching you, but also brining the biggest smile to ones face. After leaving this fall we drove the 50meters to the Gljúfrabúi. A small slot canyon leads you to an other epic waterfall cascading down into a small canyon. TIP: Get there as early as possible to avoid crowds. Driving Route 1 around the southern part of the Island- you are met with one epic seascape and glacier after another. There are honestly to many to name and for the sake of my own sanity and your attention span I will list the highlights of the first day. 2. Glaciers- I’m not even sure on the names but driving in-between Reykjavik and Hofn every corner has a stunning glacier. At one point I counted 7 from where I was sitting enjoying a beer. 3 Jokulsarlon- Ice Lake- this was top 3 for me. It is a huge lake that has hundreds of icebergs and ice floes milling about. The food in Iceland was to die for. Honestly, it was some of the best food I have had in years. The quality of the meat and the utilization of local resources made each meal one to remember. The cost however is high. Expect to spend anywhere from $50-130 per meal for anything quality. We had a few treat your self nights that included lobster, salmon, and lamb. Day two we awoke to a gorgeous sunrise and began making coffee in the van. Our van was decked out with a burner, cookware, and a cooler you could plug in. It was a great set up and made saving money on lunches and breakfasts easy. We stopped on our first day at a local grocery store picking up bread, meat and some cheese. Additionally, we brought our own travel coffee cups from home. My go to is the Stanley Classic Camp Mug, it NEVER spills and keeps drinks piping hot for hours. After leaving Hofn we started driving north towards Bulandstindu, the drive hugs the coast and if you continue driving north this stretch is known as the “highway of fjords.” Since we were only here for 4 days we opted for a bit of a short cut and went off Highway 1 and onto Highway 939, which is a dirt road that cuts a little inland. This road provided stunning scenery, more epic waterfalls, and showed a bit more of Icelands interior. Once we got off 939 at Egilsstarir we headed east towards Seydisfjordur. I love the movie Walter Mitty, the story of a middle aged man stuck in a job he doesn’t love until one day he sets off for an epic adventure that takes him all over the world. 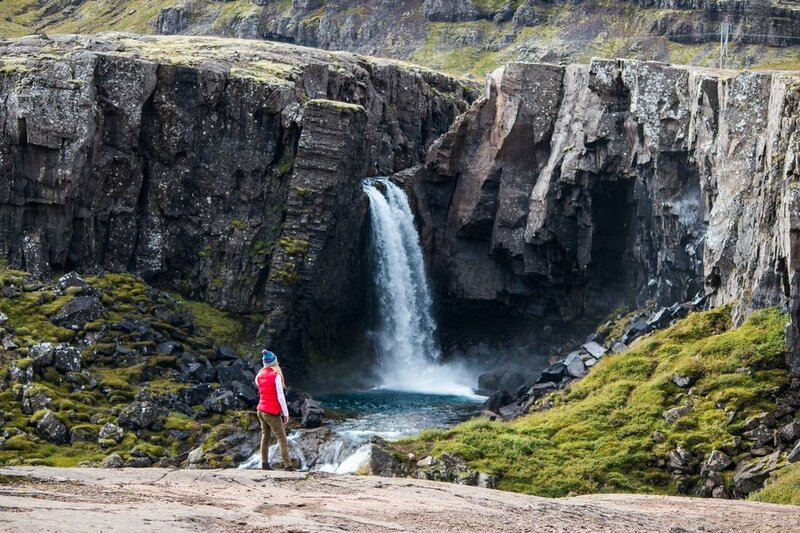 Once of the best scenes in the movie is where he longboards down an epic road in Iceland. This scene (and this movie) has always stuck with me and I decided to find this road. The road is in-between these two cities ( Egilsstarir and Seydisfjordur). While the drive is not long- apps 45 minutes.- you are met with hair pin turns and stunning vistas. We pulled over multiple times to just stare at the epic scenery. 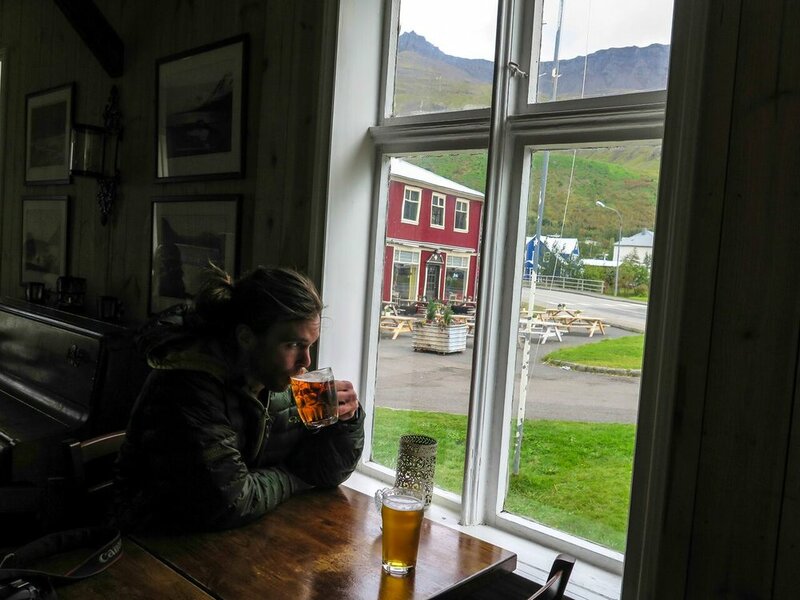 We stopped for lunch in Seydisfjordur at the local brew house and then across the street to share some fish and chips. Like I said earlier, this trip quickly turned into a culinary tour for me. While the beer in Iceland is quiet good, all alcohol is crazy expensive. Imagine $12 for a lager. Additionally the liquor stores are all government run and the hours vary from town to town. We went to 4 different vinbudins (the Icelandic name for liquor stores) before finding one that was open. While great for our health, I was frustrated at not being able to enjoy a wine in the evening. After lunch we made the final push to Myvatn. The geothermal center of the north. With their local hot pools touted to the “as good or better than the Blue Lagoon” I was quick to get involved. While not as inexpensive as I would have thought- for two people it was $100 for entry and a beer each. The pools are milkly blue and to die for. After loosing a ring, and spending 20 minutes diving down looking for it we spent the next two hours laying in eh baths and enjoying a beer or two. The weather was cloudy and misting, which only added to the ambiance. The Myvatn hot springs are not to be missed and if you had a moment to treat your self- let this be it. Upon entry you can buy a bracelet denoting how many drinks you bought. The attendant will hole punch your bracelet and bring you your drinks in the pool. We spent the night at a campground outside of Myvatn, waking up early to get on our way again. We were met with a light drizzle but nothing that could damper our van adventurer spirits! We decided early on to take a large detour in a peninsula in the north of Iceland. Lonely Planet noted that its was pure northern Iceland and the culture was as pristine as it comes. After Highway 1 we headed north on Highway 82 towards Dalvik. 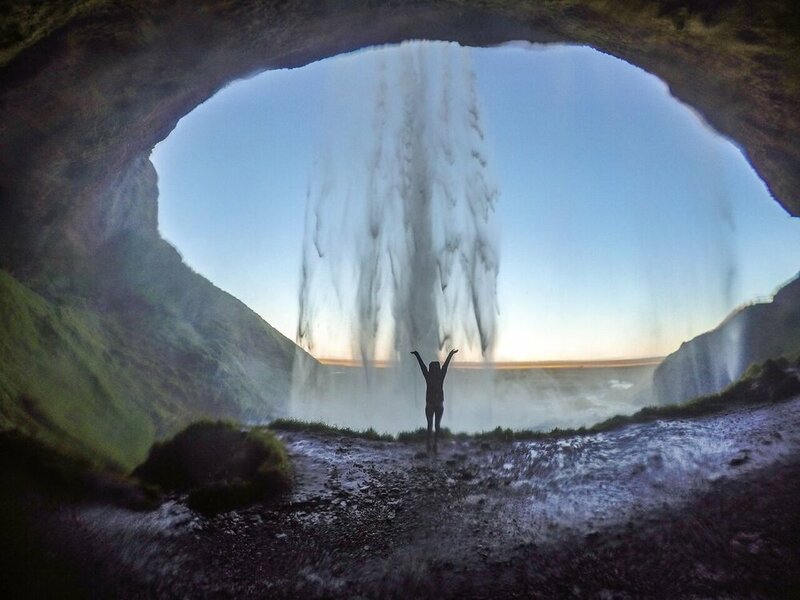 The coast of northern Iceland was wild and free (like many instagrams). It was sunny and the road continued to call us further north. Stopping in Dalvik for seafood chowder (do not miss this cafe) we continued onwards through the wildest set of tunnels I have ever encountered. Miley and miles of one lane tunnels, with only pullouts throughout them, greeted as as we got to the northern part of the Island. We stopped on the road side for lunch, a quick meal of bread, cheese, and turkey- an easy way we were able to save some money throughout the trip. Towards the end of the day we made it to Hofsos. A few years ago Hofsos built an infinity pool overlooking a fjord for the low low price of $7USD. Double check the hours before you go as we arrived at 4:15 only to find out it didn’t open until 5pm. People were lined up so arrive early and enjoy the epic view of being in a warm pool over looking the northern coast of Icelands wild scenery. This infinity pool was a highlight of the trip, not only for the price, but for the scenery and sunset we were able to experience. The last day of the trip was mostly driving. We overnighted in Grettislaug, which if I’m being honest, I would not recommend. It was quiet expensive, a bit out of the way, and while there were natural pools I wasn’t blown away. I don’t mean to be negative just being honest on my personal experience. After waking up we started driving south towards Reykjavik, as our flight was at 5:30 that day. We made it to the city with time to spare, and spent the afternoon walking around- and surprise! eating. I had two lunches that day. 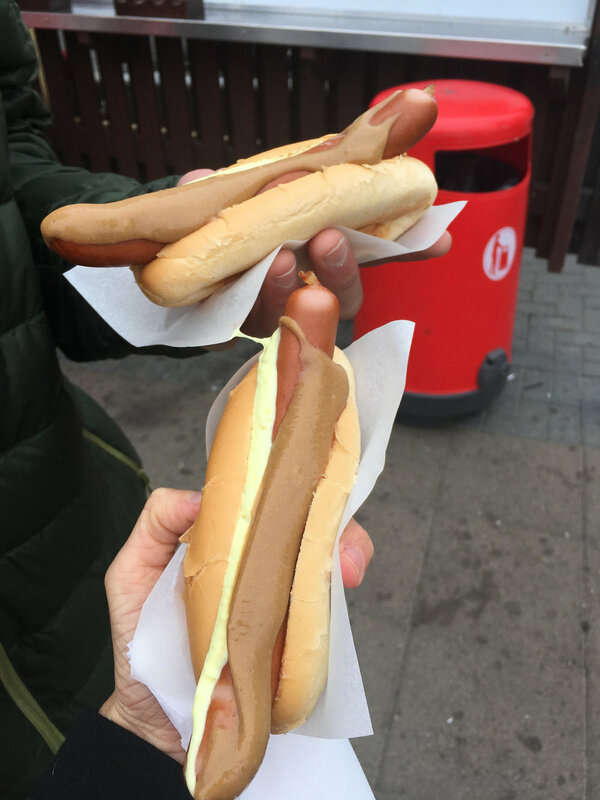 The first was an Icelandic hotdog at Baejarins Beztu , which came highly recommend. While it doesn’t look good (at all) the combination of the friend onions and mustard made the lunch epically delicious. Additionally the price was $4 so that made it a backpackers dream. After that we went to Saegreifinn for some of the best lobster soup I have ever had. It is a bit of a hole in the wall and right on the water, but a quick walk from the downtown area. I highly recommend it. In conclusion Iceland exceeded every and all. Any notion I had of this country was exploded and made more epic. From the friendly locals, the jaw dropping scenery, the unforgettable food, and enjoying it all via van- the only thing I can say is that I’ll be coming back for a lot longer next time. If you ever have a chance to go here, please don’t let that chance pass you up. 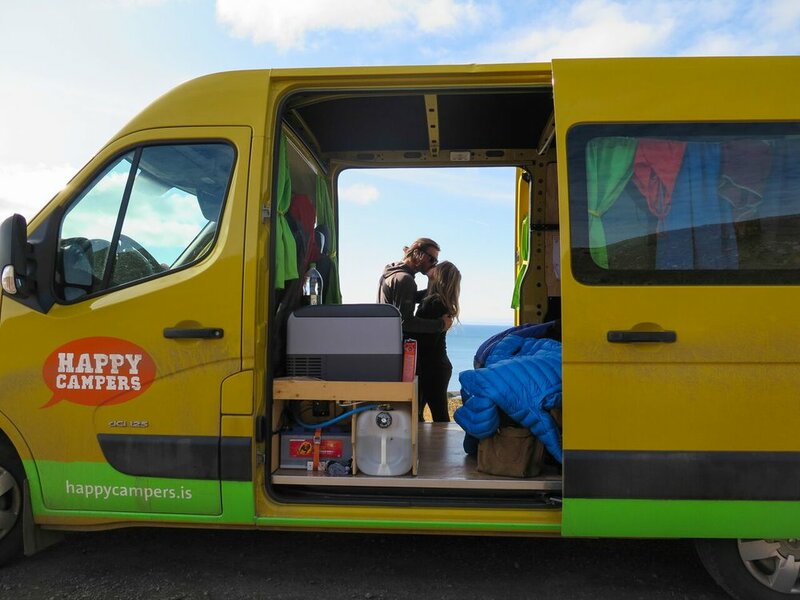 A special special thanks to Happy Campers for providing the most epic adventure mobile. This trip would have been nothing without living in a vehicle I could call home for a few days.